Estudiantes impressed in the first half, and rode their luck in the second. 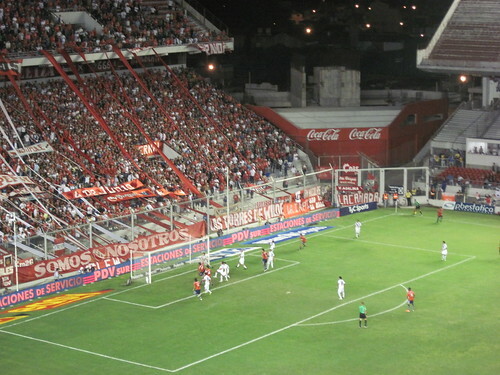 Friday night still saw them start their Clausura campaign with a victory though, 2-1 over Newell’s Old Boys, for whom loan signing Claudio Bieler from Racing missed a sitter. Gastón Fernández and Gabriel Mercado scored Estudiantes’ goals. In Avellaneda, a thoroughly entertaining opener saw Independiente and Vélez draw 2-2, with Wednesday’s penalty-winning national team hero Juan Manuel Martínez grabbing an equaliser for Vélez with twelve minutes to go, after they’d been 2-0 down at half time. All the goals are right here. Sam, these goal videos with radio commentary are great, takes me right back to listening to RAE on shortwave in the 90s!